With the 4-0 thrashing in the last Clásico still fresh in the club’s mind, you would’ve forgiven Zidane for instructing his side to be cautious, but the way Madrid went about it in the opening 25 minutes was too cautious. From the first second, Madrid refused to tread into Barcelona’s half, not straying far from the 40 yard-line. Ronaldo, Benzema, and Bale looked to cut out passing lanes, while Modric, Kroos, and Casemiro, waited to snap at the heels of Barcelona’s midfielders (particularly Busquets, who was zonally marked by whoever was near him) and attackers. The formation was essentially a defensive 4-5-1, with the focus being on clogging the midfield in order to prevent Barcelona from playing through the middle. This was all well and good, but Real Madrid were so conservative, that they couldn’t even spark an attack until Ronaldo carried the ball up the field, taking on the entire Barcelona defense himself around 8 minutes 30 seconds (it resulted in a goal kick, but it was Real's first attack). But such a run couldn’t spark anything from Madrid, as BBC remained isolated and Barcelona’s press suffocated any passes attempting to be played from the midfield. Kroos called for more pressing from his teammates on 13 minutes, leading to some braver play that coincided with the applause for Johan Cruyff, which then led to Modric slipping in Bale on the counter on 15 minutes. But that was an isolated moment, as Madrid still struggled to create after that moment. But perhaps, even more worrying than Madrid’s toothless play, was the fact that Barcelona were working their way around Madrid’s low block. Suarez dragged Madrid's CB's out of position, leaving gaping holes for a Barcelona attacker to exploit at the heart of Madrid's defense. The movement of Suarez in particular, dragged Madrid’s center backs and midfielders all over the place, allowing Barcelona to dink balls over the top, which one of Barca’s forwards would then control, and then either switch play or link-up with a joining attacker. Barcelona had seemingly found Madrid’s weakness, Los Blancos were not positionally sound. Too often in the opening period did balls slip in behind Modric, Kroos and Casemiro, and too often were Pepe and Ramos charging up recklessly to try to win the ball. This left gaping holes in Madrid’s defense that Barca looked more ready to exploit as every second passed by. But then, something changed. A counter released Ronaldo down the right flank, who used some brilliant trickery to ease past his man and release Madrid’s first shot on goal. This seemed to give some belief to the rest of the team, as Madrid suddenly emerged from their shell. After Ronaldo’s shot, Madrid began to institute a sporadic press, carefully started by either Modric or Kroos in select moments, so as not to constantly leave too many gaps behind them. This shift in tactics, possibly started by Zidane on the sidelines, disturbed Barca, as they became wary of Madrid’s threat on the counter. The release of pressure periodically also gave Madrid’s back-line their confidence back, as they began to shut-out MSN in one-vs-one situations, and made crucial interceptions on through balls. The offside trap also came into effect more consistently, as Luis Suarez was caught out in key moments. Real Madrid also started to play the ball more effectively down the flanks. Players began to receive the ball with a purpose, as they immediately turned to switch the ball to Bale’s flank whenever they had the opportunity. Marcelo for his part, made sure that Ronaldo got his fair share of touches, and as Madrid began to attack, it soon became clear that Madrid’s explosive wingers had a handle on Barcelona’s fullbacks. Ronaldo in particular was on fire, completing a match high 3 dribbles and drawing 2 tackles in the first half. Yet as the first 45 minutes came to an end, Zidane must’ve known there was still a lot of work to do. BBC had only a combined for 45 touches between them, with all of Madrid’s 5 shots coming from them. 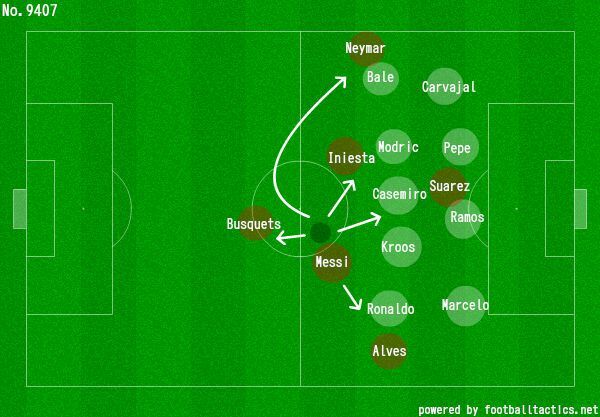 BBC were still too isolated, and Madrid were relying on them to do everything in attack. Part of the problem was that Benzema was not on top form. His usual link-up play was missing, as he was sloppy on the ball, making 4 bad controls in the first half, and he skied a brilliant chance to give Madrid the lead. Yet there was reason for hope for Zidane going into the second half. Barcelona were rattled, and their penetrative play had disappeared into long balls or sideways passes. The match was there for Madrid’s taking, and boy did they take it (well, eventually). The second half started off shakily though for Madrid, as Pepe had a mad moment where he rushed out with the ball, only to lose it and give Barcelona a chance. But after that heart-stopping moment, Madrid recovered somewhat, and began to exploit space down the flanks more efficiently, as a Ronaldo challenge on Rakitic and a Casemiro challenge sparked two counters. But Madrid were still warming up, as Benzema and Ronaldo looked too isolated at times and The Whites’ attacks began to break down too easily. Barcelona got back into it because of this, and just like Ronaldo’s shot in the first half, Messi’s lobbed attempt on 54 minutes, which was denied brilliantly by Navas, sparked some belief back into Barcelona. Only a minute later, Pique scored from a corner, dancing easily past Pepe (who did a poor job marking his man), and therefore irritating every single Real Madrid fan across the globe to no end. I mean it’s sorta okay if MSN does it, but Pique?!! Why Pique?!! Thankfully though, the goal spurred Madrid into top gear as they replied only 8 minutes later. Marcelo started the counter-attack on a brilliant winding run, as he left defender after defender for dead, and just when he looked like he was going to shoot, he slipped in Kroos, who’s deflected cross arced into the air uncomfortably in front of Benzema. But without breaking a sweat, Benzema acrobatically lept into the air, and executed an astonishing bicycle kick that silenced the Camp Nou into submission. From then on Madrid were the dominant force. They formed two banks of four, pushing Ronaldo slightly higher, and released BBC on devastating counter after counter. Aside from the occasional mistake by Real Madrid’s own personnel (that Benzema ball to Suarez was a horrific moment), Barcelona rarely threatened. Things got even better for Madrid when the ever-hungry Jese came on for Benzema in the 78th minute (aside from the goal, the Frenchman had been poor, and had really been unable to establish himself as Real Madrid’s fulcrum in attack). Only minutes later, Marcelo helped spark another counter, that Ronaldo turned into a chance when he picked out Bale smartly on the right-hand side of the box. Real Madrid thought they had scored as Bale dominated Alba in the air, but the referee made a poor decision in adjudging that the dimunitive fullback was fouled. But Real Madrid continued to push and push, as Ronaldo went close by nearly arrowing a goal into the top corner. Then Bale poked a ball through Bravo’s legs, which Alba cleared. It seemed inevitable that Real Madrid would score, but one other inevitable happened first. Ramos slid in rashly on Suarez, who milked it for all it was worth, giving no choice for the referee but to send Los Blancos’ captain off in the 83rd minute. But if you thought that would kill Real Madrid’s momentum you were wrong. One minute later, Carvajal sprinted up the center of the pitch, fed Jese, who in turn fed Bale, who then crossed it to Ronaldo. Without losing a single ounce of concentration, Ronaldo controlled the ball brilliantly off his chest and slammed the ball throughClaudio Bravo’s legs. It was sheer footballing brilliance from everyone involved and the boos and whistles that had rung out resoundingly whenever Ronaldo touched the ball were utterly silenced. Calma, calma, Barcelona fans, your favorite player Ronaldo is here. Hindsight is 20/20, but I could see problems in Barcelona’s tactics well before the end of the match. Unlike Madrid, who were disciplined in their defensive duties from Ronaldo to Pepe, Barcelona featured a top heavy side with no defensive commitment from MSN. 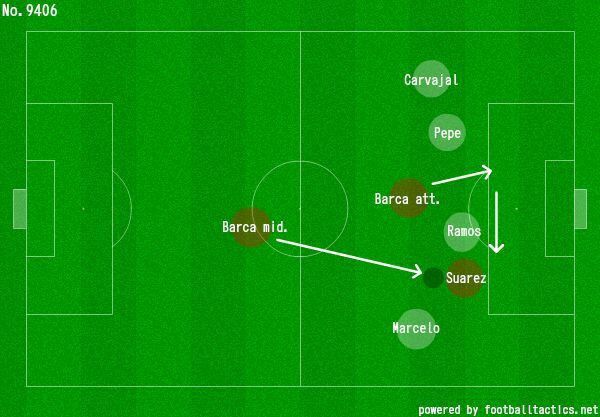 Take a look at Barcelona’s shape on the flanks (it’s not pretty viewing for fans of La Blaugrana). Messi played into Madrid's hands by drifting centrally. Neymar's positioning shows almost no movement in his own defensive third. Barca's fullbacks pushed up way too high. Firstly, Messi’s forays into the center of the pitch, which was an attempt to help Barcelona in build-up, proved useless. He never found a scything ball across the floor, and instead had to resort to lobbed passes that really only came off once (in the 80th minute, where Suarez volleyed past the post). Instead, Messi’s positioning had a destabilizing affect on Barcelona’s shape, as he left Barcelona’s right flank completely open to Real Madrid’s most lethal player on the park, Cristiano Ronaldo. 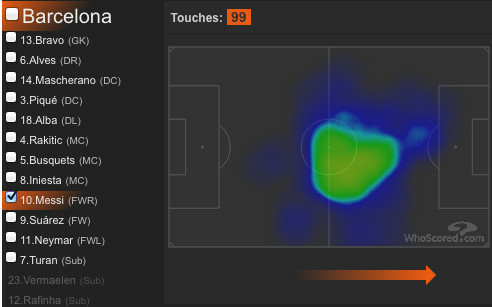 Dani Alves was also pushing up insanely high (as can be seen on the heatmap, is average positioning is above the halfway line), which is almost as bad as putting a neon sign on Cristiano Ronaldo’s forehead that says, "pass the ball to me, I am totally free." But Messi’s positioning also did more than hurt Barcelona defensively. It arguably weakened Barca’s attacking options, as he refused to combine with Alves on the flank and provide width to Barcelona’s attack - which would’ve stretched Real Madrid’s back-line. 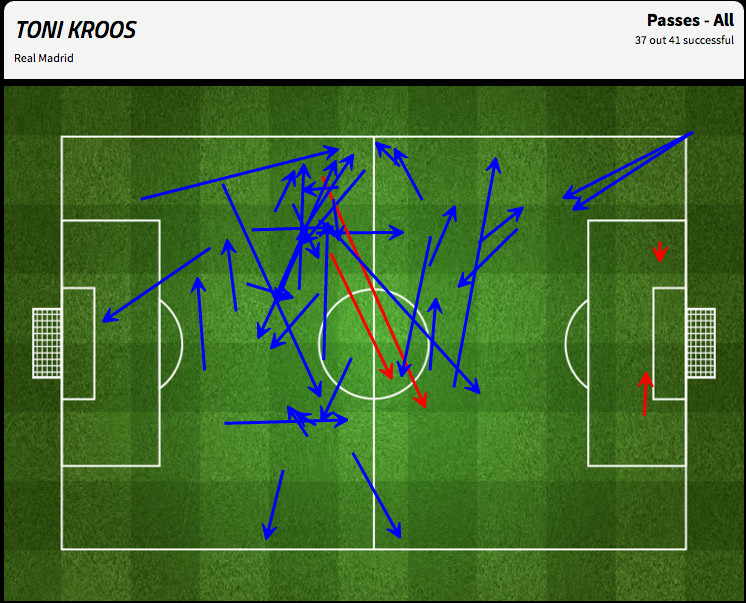 All of Messi's passing options were either cut off, or were useless back passes or sideways passes. Instead, his central positioning played straight into the hands of Madrid, as Los Blancos’ defensive block could clog the center of the pitch. There is also the small matter of the fact that Messi’s positioning allowed Casemiro to hound him day and night. Overall not a good night for the Argentinian genius. It remains to be seen whether Messi made these decisions himself, or whether Enrique instructed him to position himself that way. But based on these post-match quotes by Enrique on MSN, you’d have to guess that Messi decided things for himself. But let’s not let Neymar or Jordi Alba get away with it! Jordi Alba was also positioned insanely high, refusing to time his runs with Dani Alves, causing Barcelona to have a back tow instead of a back three at all times. The Spaniard’s positioning gave Bale total autonomy down the right flank, which was only exacerbated by Neymar’s total lack of defensive effort in shutting Bale down. With such poor preparation buy Enrique, and no defensive effort on Messi and Neymar’s part, it is easy to see how Ronaldo and Bale tore Barcelona to pieces down the flanks. It was a long time coming in this article, but Casemiro was brilliant. In the first half he was slightly shaky positionally, but that was no different from the rest of the team. He made 5 tackles in the first half and was Madrid’s strongest performer in the first 45 aside from Bale and Ronaldo. 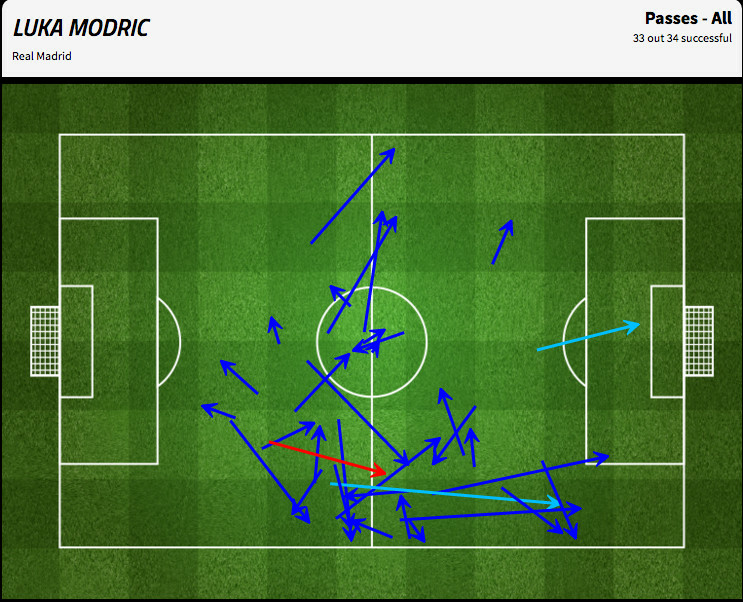 But in the second period of play, Casemiro took things to the next level. Zidane’s tactics of clogging the midfield and Messi’s unwillingness to use the flanks played straight into Casemiro’s hands, as he used his physicality to dominate Messi and others off the ball. Simply put, there was no route through the center (Barcelona’s main avenue of attack not only in this game, but in many others) because Casemiro was an absolute brick wall. This allowed Madrid to stifle Barcelona and win the ball with ease, allowing the likes of Modric and Kroos to release Ronaldo and Bale down the flanks. He ended the match with an eye-catching 8 tackles, 3 interceptions, 1 clearance, and 2 blocked shots; proving Zidane right for choosing and possibly cementing himself as the centerpiece to any counter-attacking scheme Real Madrid plan in the future. The final mention must go out to my favorite winger-duo in world football. For all of Real Madrid’s heart and grit in midfield, the win would not have been possible without the stunning wing-play and discipline of the Flying Welshman and the Dark Invader. Firstly, Bale and Ronaldo were the outlet of pretty much every single Los Blancos attack. As you can see above, Kroos and Modric centered their passing around the flanks, as they dumped imagination into the dumpster and simply made the right decisions, as they pumped all of their attack-minded passes towards the flanks. This put a lot of pressure on Ronaldo and Bale, as Benzema was off-form and the only support they received was from their fullbacks. This meant that CR7 and Bale needed to carry the ball up the pitch themselves, which would not only have been exhausting but extremely difficult technically. Yet they carried out this duty with ease, and tortured Barcelona’s fullbacks with their pace and their invention (Ronaldo in particular). It all paid off in the end, as Bale got his assist and Ronaldo got his winning goal, to help a 10-man Madrid bury Barcelona. But their unnoticed and possibly more important work, was what they did without the ball on defense, as they positioned themselves carefully to cut off passing lanes and prevent any attacking inroads down their flanks. This was crucial to Zidane’s scheme of compressing the pitch and clogging the midfield, as Barcelona was then forced to play the ball through the middle. The few times the ball was played down the flank, Bale and Ronaldo helped shut out the danger immediately, with Ronaldo’s tracking run on Jordi Alba in the 40th minute a particular highlight. Such commitment was just outstanding to see, and in hindsight you can see why our wingers were so important to Real Madrid’s victory.